Concepts like “Shiite oil” and “Kurdish oil” obfuscate the debate about Iraq’s energy resources. This paper starts from the proposition that it would be better to call a thing by its name: in terms of the size of reserves, Iraqi oil is first and foremost Basra oil. 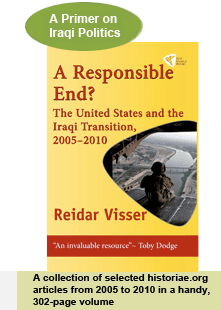 Accounting for one of the world’s greatest concentrations of petroleum wealth, almost all of Iraq’s supergiant oil fields can be found near Basra or in one of its two neighbouring governorates. The other six Shiite-majority governorates of Iraq have little or no oil, and even the most optimistic estimates of new discoveries in Kurdistan pale in comparison with the reserves of Basra and the far south… Full story here.